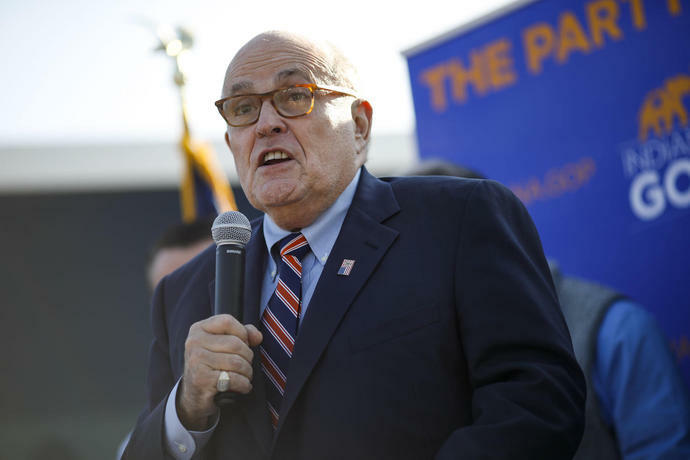 Rudy Giuliani on Wednesday suggested that members of President Donald Trump's 2016 campaign may have colluded with Russia - but insisted that Trump himself had no involvement. It was a marked contrast to the Trump Administration's repeated denials of any wrongdoing within the presidential campaign. "I never said there was no collusion between the campaign, or between people in the campaign," Giuliani, Trump's lawyer, said during an interview with CNN's Chris Cuomo. "I have no idea. I said the President of the United States. There is not a single bit of evidence the President of the United States committed the only crime you can commit here: conspired with the Russians to hack the DNC." "How would you know that nobody in your campaign [colluded]?" Giuliani said. "As far as he knows, that's true." That's a significant change from the "no collusion" line Giuliani has repeated as recently as July. At that time, Fox News contributor Guy Benson asked Giuliani, "Regardless of whether collusion would be a crime, is it still the position of you and your client that there was no collusion with the Russians whatsoever on behalf of the Trump campaign?" Trump has repeatedly denied collusion with Russia, both personally and by members of his campaign. As recently as Dec. 10, he tweeted, in all capital letters, that there had been, "NO COLLUSION."